Drupal 8 incorporates a Modular Authentication System which, given a request, attempts to identify a Drupal user by inspecting the HTTP request headers. 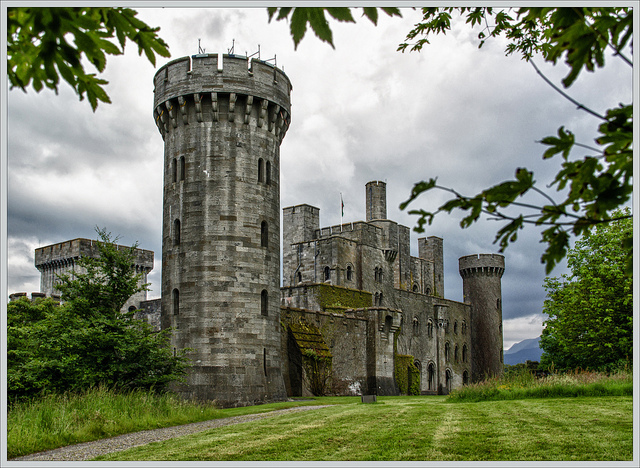 Authentication comes in handy when we want to restrict access to a resource in Drupal. It can be applied to any route, although the method to implement it may differ. It is most commonly used to identify requests when we are exposing data through an API from our Drupal site. Imagine you are going through airport security. The security agent asks to see your ID – a passport or driver’s license, say. The act of showing your ID is what we call Authentication. In Drupal – as in almost all websites – your authentication credentials are your username and password. Next, the security agent checks your boarding pass to verify that you are in the right place and have clearance to get on a plane. That’s called Authorization. In Drupal your role (and therefore the permissions assigned to that role) are your Authorization credentials. To summarize: authentication means who are you? ; authorization means may you proceed?. Thanks to the Modular Authentication System, different Authentication Providers may extract a $user out of a given $request object. The Module Authentication System manages methods to authenticate a given request. It loops them, passing the request and expecting NULL or a Drupal user. An Authentication Provider is a method of identifying a user by inspecting the HTTP request headers. For example, Basic Auth checks that there is a username and a password at the Authorization header, while Cookie checks if there is a cookie ID, and searches for it at the sessions table. The $user object is no longer a POPO (Plain Old PHP Object), but an instance of the UserSession class which represents a Drupal user. The $request is an object oriented representation of an HTTP request. It is powered by the Symfony HttpFoundation component and allows, among other things, access to the request headers. Let's use an example to illustrate the above. Below, we can see an HTTP client that is making a request to a Drupal 8 REST resource. We are requesting the node with nid 1, and identifying ourselves through Basic Auth. We also give permission to the Authenticated user role so a user with username test and password test has permission to access this node. 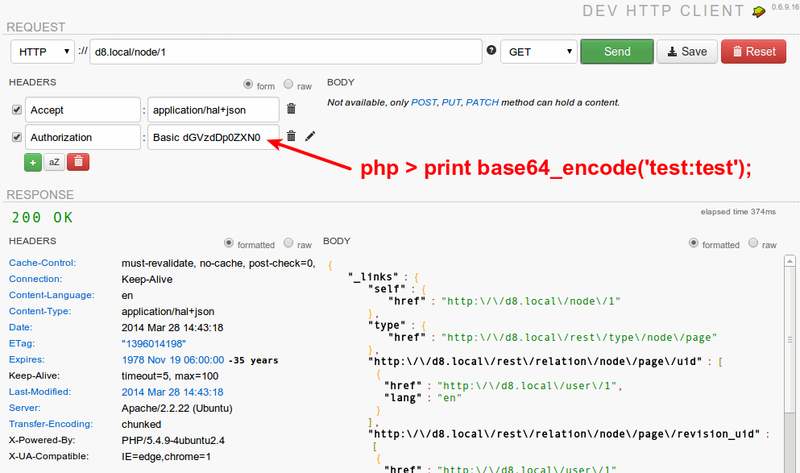 As we can see above we get a successful response (code 200 OK) and on the right-hand side there is the HAL+JSON representation of the node that we requested. Drupal 8 ships with two Authentication Providers in core: Cookie and Basic Auth. Cookie-based authentication is the default: it looks for a cookie ID in the request headers and returns an existing user ID if a match is found. If no match is found, the anonymous user object is returned. * Performs an OAuth request to retrieve a node. * Alters existing routes for a specific collection. *   The route collection for adding routes. // Load the route, set authentication and add it again. Adding authentication to custom routes is pretty straightforward since it can be set at the route definition. In Drupal 8, routes are defined in YAML files. Authentication is just another property of the route as an array of supported authentication methods. The above settings require an authenticated user through either Basic Auth or OAuth authentication methods. 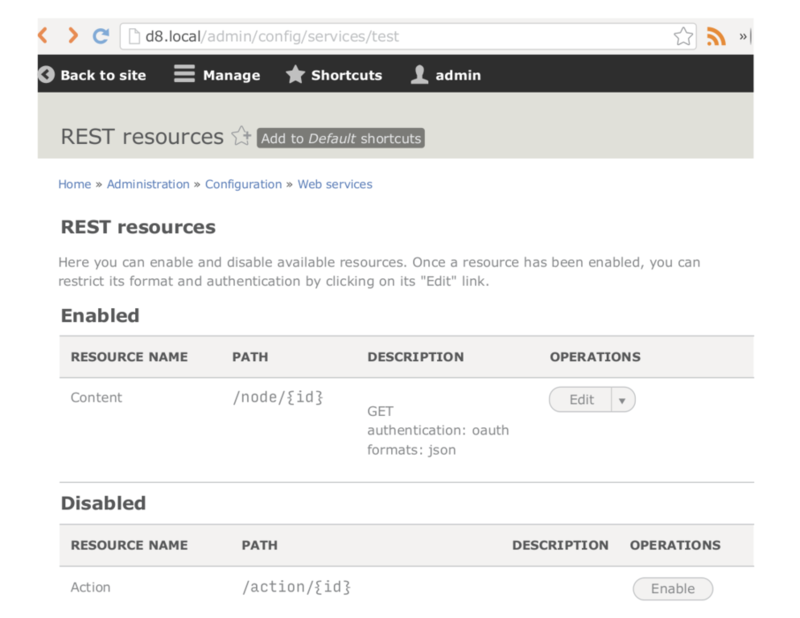 REST module supports authentication so you can set it while defining a REST resource. In Drupal 8, REST resources are defined in YAML files per entity type, where each of them lists the available HTTP methods and their properties. You can find some examples at the REST documentation at Drupal.org. Note that there is a contributed module called REST UI which allows you to configure REST resources through the user interface. You are now fully armed to protect your Drupal resources, no matter what they are. You also know which authentication methods are available both in core and in contrib. If you ever need to implement your own authentication method, remember to contribute back to the community! You can take OAuth module as a template and start from there. 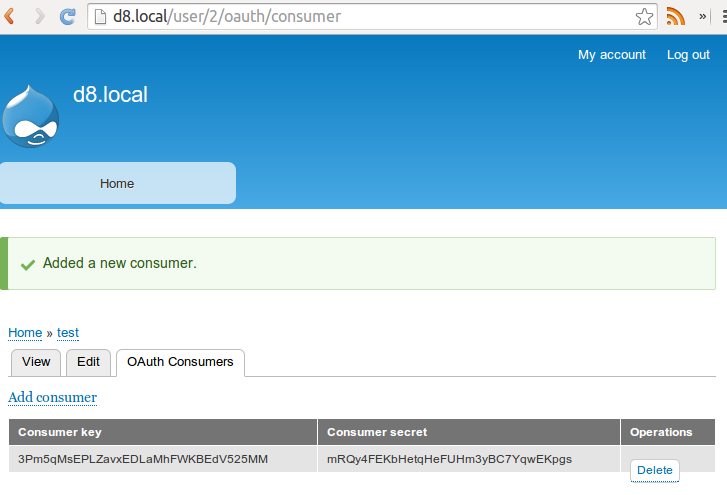 The Drupal Core AuthenticationProviderInterface is pretty well documented too. 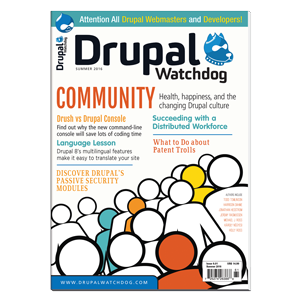 There is still work to do in the Authentication area of Drupal 8: Search for Authentication in the core issue queue to learn more.